As requested by one of my readers in the comments on my Phoenix Power Rising Review I just checked out a new craze to hit the net… Instaniche. So let’s take a close look at this online business opportunity and see is Instaniche a scam or is it legit? Introduction: So what is Instaniche about? 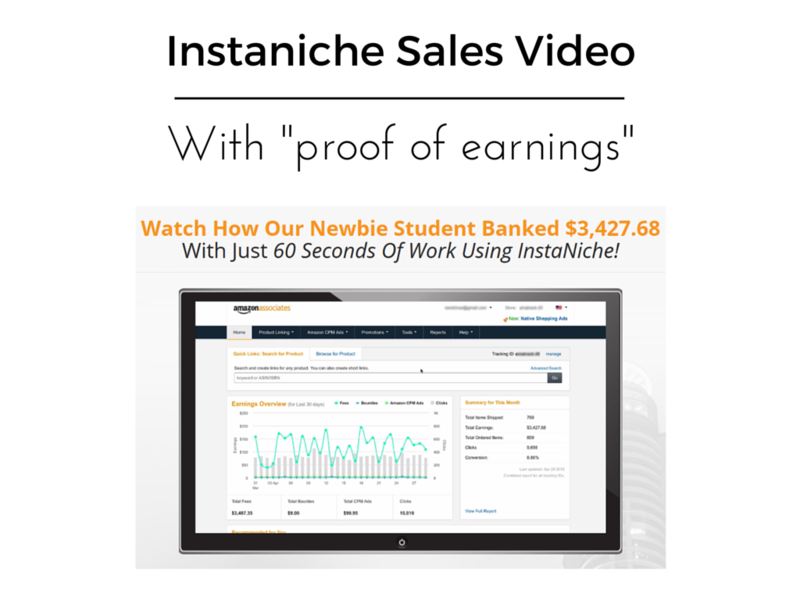 Instaniche is software what will create you a full money making website within 60 seconds. 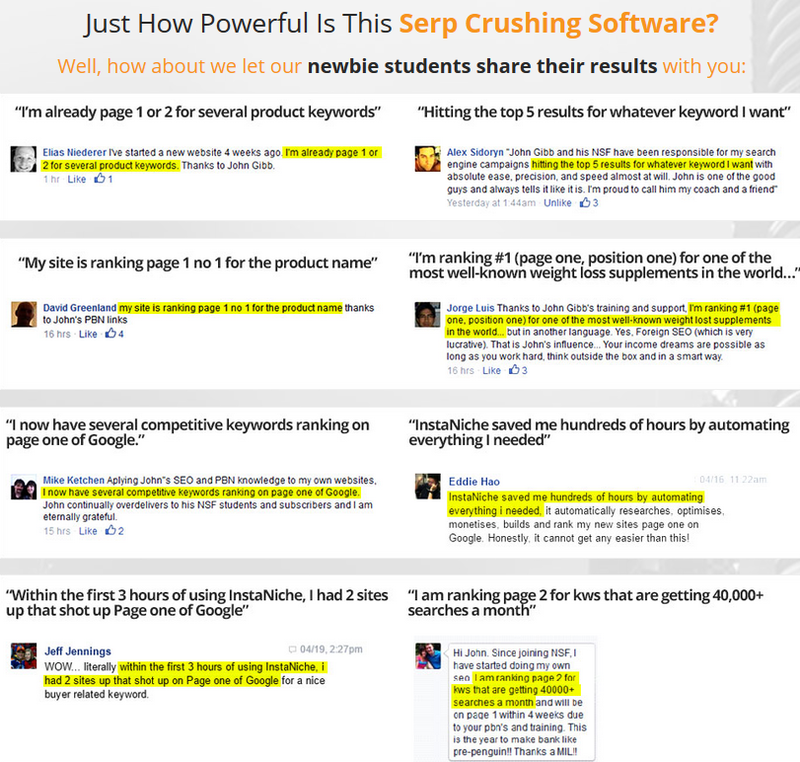 So firstly the software will find you the hottest niches with the most profitable keywords. You then choose which niche and keywords you want. From there the software will take 60 seconds to create a quality website with great original content that ranks almost instantly first on Google. It will be fully SEO optimized and monetized for you. Ok so let’s get back to reality here. 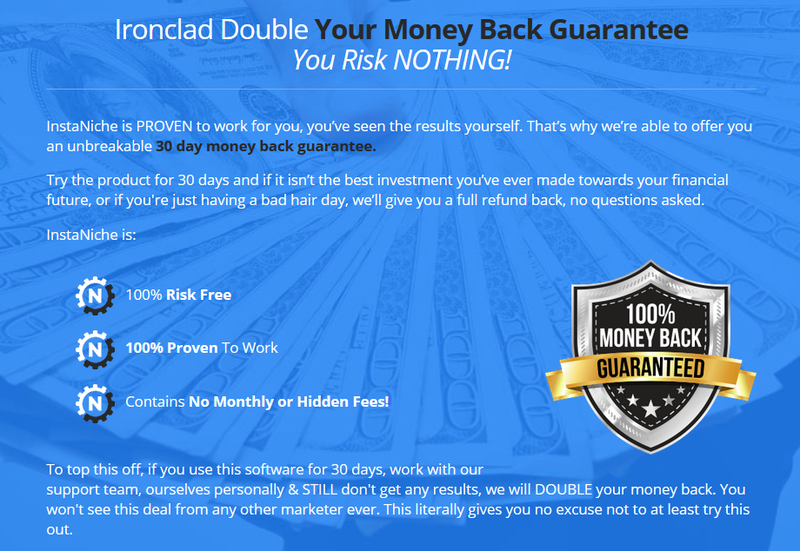 This is a perfect example of a new website that claims to have the hottest software to ever grace the internet that will make money on autopilot, fast, easily and you don’t have to do a thing. It is groundbreaking, it is revolutionary, it is brand new, it is a secret formula… yes it is! It is so original that all the scam websites have the same claim. If you have a look at my article on how to avoid scams online you will see that Instaniche has almost every single warning sign. We have the sales video that claims to show you how you will make thousands of Dollars every month on autopilot, complete with “income proof”. We also have the typical so called testimonials from loads of happy customers… how real do you think these testimonials really are? Personally I find them very suspect. Only one page to a website and testimonials take up a nice big spot? Show me more about the product rather, give me more information. If the product is good it will sell itself, no need for testimonials. And here they claim that Google has left a loophole open which means they can rank #1 on Google each and every time. Sounds good right? Oh and here is my favorite part with scams…. the famous scam countdown! 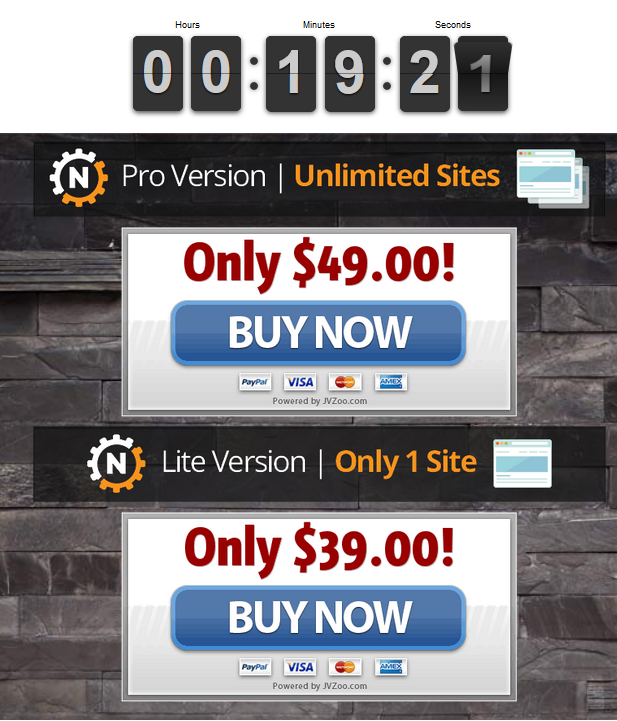 So you’ve only got 19 minutes to get this incredible software at this amazing price… right? Hurry hurry quick… get out your credit card NOW! Well check the date on my post because I bet when you do there tomorrow or the next day, or next month it will still be the same silly countdown at the same price. And then this is nice they have a 30 day money back guarantee. I like this touch, it makes you feel safe that if you pay your fee and it doesn’t work you can just get your money back. The question here is whether you will really be able to get your money back. And of course their earnings disclaimer doesn’t have any wild promises like you have just read. Let’s just take a quick look at their crazy claims. 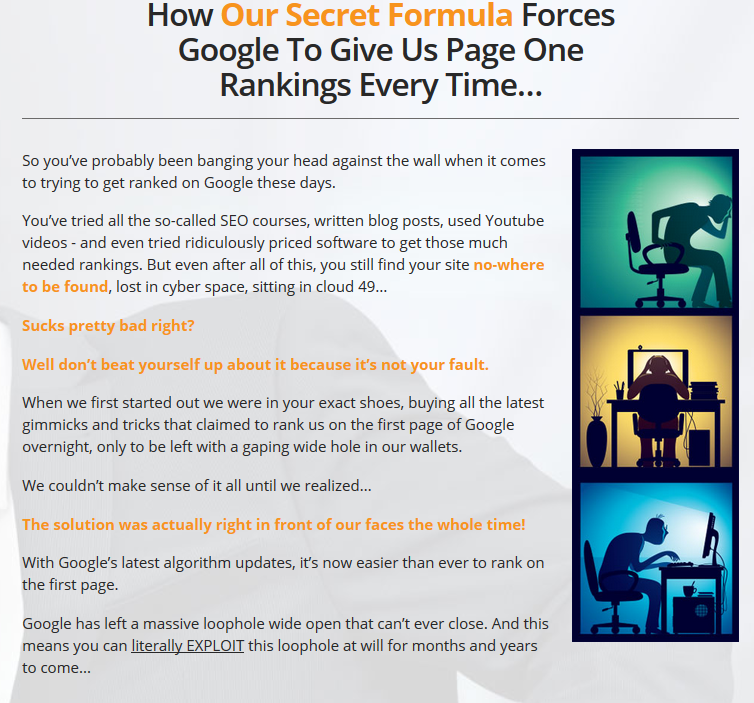 They will rank brand new website for all your chosen keywords #1 on Google instantly? Yeah this is insane, and it will never happen. Firstly when a website is brand new it doesn’t even exist in the eyes of Google, it must first be indexed and this takes some time. My websites took about 2 weeks to be indexed by Google. Until your website is indexed you won’t rank at all. The next part about ranking your keywords is that it takes time for Google to give your site some authority. A new site has none, so getting any rankings for a new website takes some time too. There are so many things that go into ranking a website that software just cannot do. And if this software can by some miracle do this all, when the next Google update happens chances are your website will cease to exist in the eyes of Google. Any loopholes that are left open are closed by Google on a continuous basis, websites that try and trick Google get penalized when these loopholes are closed. So even if your so called thriving business takes off it will only be a matter of time until it crashes. The next part of this software that bothers me is the so called quality and original content that your website will have. Really? So someone with content writing skills has gone and pre-written content for you for all the keywords you have chosen? Hardly likely. This is what is called “spun content” and it is terrible, it is barely readable. What this means is they are taking content from someone else’s site (yes basically stolen) and used spinning software to make it “original”. Have you seen a website with spun content?Not great in my opinion! So you are going to have to go and rewrite all their content, which makes me wonder why you don’t just write your own content in the first place? There are so many glitches with this product, for example your online store shows the Amazon prices which is not good because Amazon doesn’t allow that. A whole stack of the products come up without an image…. You will also need to continue to add new articles yourself and to keep working on your website which is not made clear from their sales page. If you don’t know anything about working online it is very likely you will see this as a once off payment, a few minutes work and then a stream of income for life on autopilot. This is just not true. Are you looking for a REAL small online business opportunity? Well if you already know what you are doing and can use a fully set up website with free hosting… that you need to change completely to make readable then you go for it. I have to admit the ready made little shop part is nice… but you will have to know how to change so many things. The way I see it is if you promise me something and you guarantee me I will make that amount of money in that amount of time, you must deliver right? And if you don’t you have lied to me and been dishonest. So I just don’t look favorably on them for these claims. They do give you software and you will be able to set up your websites fast… but it will not do what they promise you in terms of rankings and income. On one hand I think this is a nice enough product, but then I look at their sales page and I get really annoyed. If they had been honest and upfront on their sales page about what their product does I would have given the, a much better review and rating! They are trying to make you believe that they can make you rich overnight online and it is just not going to happen. The way they have set this up is just the same as all the other places you have probably tried and failed at. The things they promise they can do are things of Fairy Tales, not reality. I am not saying this to bash another company and its products, I am saying it because it is a fact. I would love to believe in it. It would love to spend just $49 once off and then be able to build multiple websites that take just 60 seconds to create… thousands of them… and each one makes me thousands of Dollars a month without me having to do a thing. I would love to be able to tell you that it is real and it works, but the truth is you will be given a website with an online store, with affiliate links and free hosting. You will then need to spend a considerable amount of effort changing a lot of things. The biggest problem I have is that the people that believe this will work most likely have no experience working online, which means they won’t know how to change these things and make it work for them in any way. What do you think? Is Instaniche a scam or legit? Leave a comment and let me know if you are rolling in the cash from this opportunity or are you once again feeling disappointed ? Not sure about Instaniche? Check out my #1 Recommendation for making money online. When I saw your rating of this Instabiche I said to myself, wow she does not like them very much. So this about creating a site in 60 seconds does not look bad at all, and I know it is possible, there are other places where they do so as well. Even the price looks very reasonable. Now the part about making money looks too good and my guess you are write about it. But it seems to me they do not claim you would do nothing, as I understand they offer a safe passage to the Google top page with your posts, and this sounds like a cash. So what if they have really found the way? Yes a website can be built in 60 seconds or even less. But that is the bare bones of it. To add a website full of relevant, well written quality content, complete with affiliate links, all content ranked #1 on Google and making money immediately? Making thousands of Dollars in its first month. The thing I have a problem with here is that they have said on their website you don’t have to do anything past choosing your high converting niche and keywords from the selections they have on offer. After that you just pocket the money and it will be buckets of it? That is where I give a zero rating. The thing that is missing here, the key ingredient that I am after is reality. Where is the reality in this? This sounds like all the other previous scams I’ve come across. The theme with these scams are that you don’t have to do anything, you don’t have to learn anything about online marketing, you will make money on autopilot, you will make money fast and easily. Guaranteed to make money immediately. I have a big problem with these huge promises. If they are made they should be fulfilled. Do you think each and every one of these promises will be met? what a perfect review for an imperfect product. these types of places are the worst. They prey on beginners who don’t know any better and people that are desperate. Any person that writes and tries to get on page one of google knows there is no sure fire way to get on page one unless you write low competition and long tail keywords. Even then it’s tough. I like the place you recommend too. Wealthy Affiliate is a high quality product. It’s funny Instaniche brags about spending $30,000 on software development. I know for a fact Wealthy Affiliate has spent millions on theirs and so have other good content marketers. That is exactly it. I suppose it is much harder to market legit programs that are honest and say sorry you’ll have to put some work in here! And website ranking is just one element of this whole puzzle. Once you are ranked and you are getting traffic you need to actually get your visitor engaged and interested in your content. How can software spin content into something that is written with the audience in mind? Great review you have here. I have already registered it at the back of my mind. Any product out there that offers instant cash, make money without hard work are all scams. Thanks for your input Martin-Joe. I am so still on the search for some great products to share… unfortunately they are so far and few between and in the search I am just stumbling across hundreds of online scams. Well now that my Instaniche review is done I think I am done for this week and I might just have found something cool for next week. I am still investigating it though to make sure! 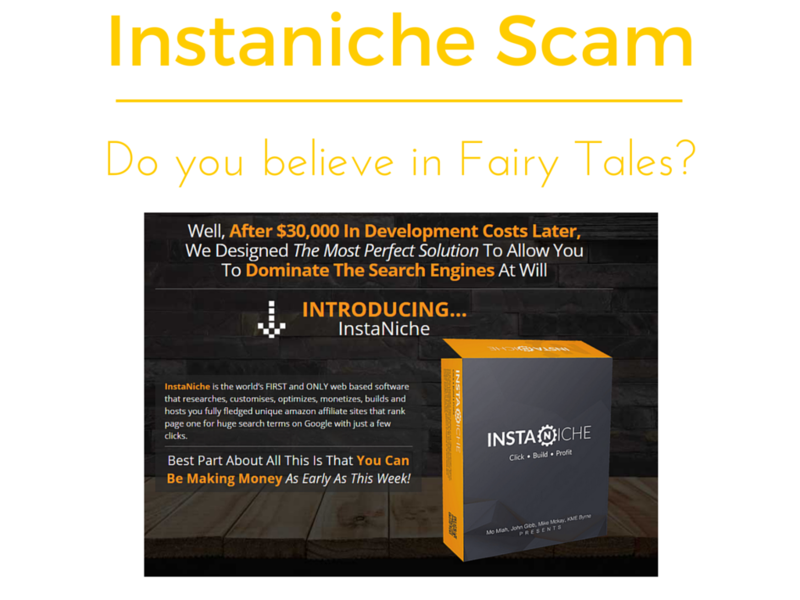 I visited your website and found it to be filled with excellent information about small online business opportunity.Your research on the instaniche is really an eye-opening piece that will catch anyone’s attention on scams. Your analysis of this type of opportunity will help us to discover the true legit business opportunity from ” those too good to be true” type of businesses. Your web contents are well written and categorized. That makes it very readable and engaged. I truly believe that your website is source of information for many new comers on small business opportunity. You’ve nailed it there Elliot, if it sounds too good to be true then it is almost a sure bet it is too good to be true. There is no pot of Gold at the end of the rainbow, if you want a pot of Gold you need to work hard and earn it. It won’t come in the form of a never before seen software that is based on a Google loophole that will just throw money at you. I should know better by now but every once in a while I buy something stupid. I bought Instaniche because I wanted a fast way to set up WordPress Amazon skeleton sites. At the purchase moment, I thought it was a good idea. However, Instaniche is such a mess I would do better just making a template site and cloning it with BackupBuddy. I didn’t buy it for the “instant riches” idea. That’s always ridiculous. The articles are crap and must be rewritten. The keywords are super broad and not really niches at all. You can’t add your own niches or articles to the database. The database doesn’t even have complete categories. Some niches don’t have enough articles to even trigger the software to make a site. So why are they even there? It’s BS. I could just go on with this disappointment but I will stop. It’s just one of those irritating mistakes one makes here and there. I’ll make a couple skeleton sites with it and try the Amazon script that comes with it. The script sets up an Amazon page with too many items but I’ll mess with it. That’s just about all I can see doing with it. Much better to just do your own websites. Hopefully more people don’t buy it. I will remember EVERYONE associated with it though for future reference. Not listening or buying anything from any of them again. Oh dear Rick, I am so sorry you are so disappointed in Instaniche. It is not what has been promised and there are going to be a lot of people that feel let down by it. You can add articles and make changes from the WordPress backend though, just give it a try and contact their support for help. Hi Rick, You might want to Google ‘PotPie Girl’ Instaniche Review, as she has bought and is implementing the same idea as you (quick fast Amazon skeleton sites… FREE hosting). Pot pie girl is also a WA member and not noted for promoting crap, and this like most software doesn’t come out the gate perfect… so hopefully you may see some value from this? Yeah I saw her review on Youtube… the point here though is that what is being promised is not what is being received. I saw a lot of other reviews. The promise is that nothing needs to be done, no experience needed and rankings, traffic and sales will magically appear. Thanks Richard. I found PotPie Girl review. Checking it out now. Saw the PotPie Girl videos for InstaNiche. Wow. Maybe there’s hope..? Still think the product is sketchy but in the right hands, maybe it’s workable…? If you are curious, you can find the videos on YouTube. I found the second one more interesting. Please come back and let us know how things are working out for you with Instaniche and if you have any tips to share with everyone that will be great. Thanks for your review on this software. Hopefully it will keep someone from making a mistake and purchasing this product. To offer so much with really no work at all is not realistic. Whenever there’s talk about being rich overnight, you can be assured that something is not right. Yes that is my big issue with this software, they make such unrealistic claims and that is just not right. Big time false advertising. hope your doing okay,you have a nice page and very ineresting one. 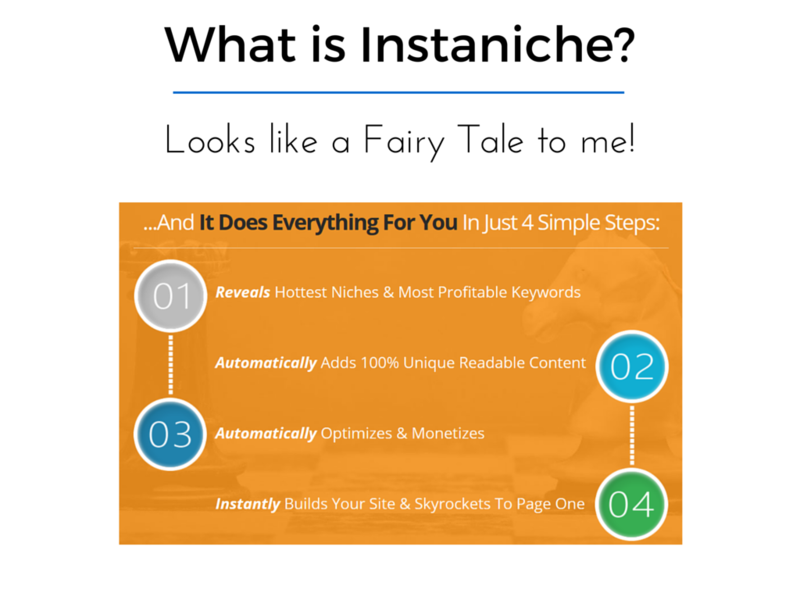 you know i dont real know much about instaniche but if it is as you explained i think it will be very helpful to use it because for what i know niche is every thing to any website that you create and without them now i dont think so if it will go much further. I would like to try it and to know how does it real work and after i have done that i will come again to give you feedback. Addition from that am real glad to visit this page and nice work in advance once again Lynne. Well you really don’t need this software to choose a niche! You can easily do that on your own without paying for software. Using this software doesn’t necessarily mean that those niches are that profitable anyway. The best thing is to rather choose something you are passionate about and seeing what affiliate programs and products are available and go ahead with your website. There are over 3 billion people online and all each of us needs is a small piece of the pie. By targeting the right keywords you can easily generate a nice amount of traffic to your website. Loved reading this and it is very honourable of you to be taking your time and care in warning people about scammy products. From what I gather, Instaniche is something that could work..could and people may make money from it but in all probability they wont make much and most certainly not a sustainable business. Well I think some people might be able to make a sustainable business… note the “some people”, not all people, not even lots of people. A few people at best. It does have some nice things to it, like having a store in a minute… that’s quite cool. BUT it comes with so many problems too. When you measure up reality next to the hype about the product it just falls so short! So how do I claim a refund? I take it that you are not happy with their product. I believe you must contact the product owners. The sales are done through JVZoo but from what I understand they won’t get involved with refunds and tell you to contact the product owners on their website. From within the software you can contact support, I suggest you do it that way. Please let us know if you manage to get your refund successfully! Now it seems a frustrating attempt to buy this product. It seems I am one of the foolish to buy Insta Niche because this site is not opening at all and even I did not get a single penny after all doing everything what they ask me to do. I think I wasted my $47 and my time. Anyway I count this as my experience which I will use to more conscious in future. I will try to get refund now. I am really sorry to hear that InstaNiche has been such a terrible experience for you, good luck getting your refund. Just keep in mind that no software or “secret” formula will make you money overnight. Hard work and knowledge will earn you money over time. Thanks for putting out a real review Lynne. Would be nice to see this article a bit more prominent on the first page of Google (just like instaniche’s claims) so that people can make an educated decision. I am glad you enjoyed this review about Instaniche. This review is #1 on Google if you search “is instaniche a scam”… see no need for a miracle software that makes ridiculous claims. All you have to do is learn the right way to do online marketing! Vikas I am so sorry you have been ripped off. It is awful when that happens. At the time I reviewed Instaniche I could see straight away that they could not give what they promised. I checked them out on Google Trends and they are just about dead now, there is no interest at all in this product. Their both CROOKS…..(Gibb / Miah)………Good Luck trying to get a refund. Yes that is what I have been hearing Mark!